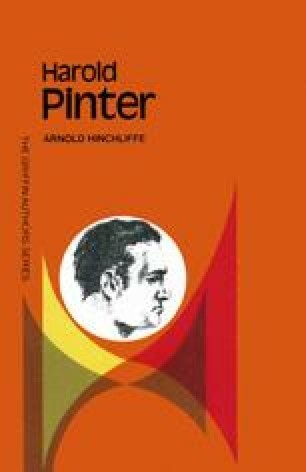 DISCUSSING The Dwarfs and the novel from which it was adapted, Bamber Gascoigne in The Observer remarked that the novel must have contained the seeds of Pinter’s plays: “As in The Caretaker three characters jockey for power over one another. The central character, Len, is pulled in one direction by the ferocious activity of Pete and in another by the indolent materialism of Mark. To escape their influence he withdraws defensively to his room, one of Pinter’s favorite images. Like Stanley in The Birthday Party, Len is paranoic; like Aston in The Caretaker he ends up being straightened out in hospital, until his vision is neat, sterilised, normal.” Such an interpretation is plausible, but the cure seems to me doubtful. And the doubt is of a different kind from that which must be felt in either The Birthday Party or in The Caretaker, in which Stanley and Aston are silenced. Len, on the other hand, may have acquired neat, clean vision, but it is attended by a lawn, a shrub and a flower, which have an imaginative pull that the dumbness of Stanley and the taciturnity of Aston cannot have. The link with The Caretaker is there, of course; and it is something more than mere chronology (The Caretaker appeared in April, The Dwarfs in December of 1960); they are both of a piece.